John Terry was educated at the Sydney Conservatorium High School where he studied composition and piano with Raymond Hanson. He held piano performing qualifications from the Royal College of Music, Royal Academy of Music, Guildhall School of Music and the Trinity College of Music. He gained a Master of Music degree in music education and composition from the University of Adelaide, and a Doctorate in Creative Arts from the University of Wollongong. Terry was recognised as a leading secondary and tertiary educationalist and spoke at various international conferences, including the International Society for Music Education. He was Editorial Consultant for the Australian Music Examinations Board (AMEB) and compiled the AMEB series Piano for Leisure. 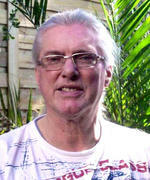 Doctoral studies at Wollongong University provided John Terry the opportunity to further explore a lifelong interest in 'arts fusion' approaches. Indeed, many of his compositions are of multimedia proportions. In the mid-1960s, he presented many multimedia events in and around Sydney. Performances of his musically eclectic 'psychedelic' works - some of which were presented by the International Society for Contemporary Music - involved prerecorded sound tracks and striking visual projections. John Terry often combined composing with other artistic forms. He worked collaboratively with visual artist George Finey, and the international avant-garde painter David Rankin. His electroacoustic and multimedia composition Spots and Variations 1, based on Rankin's paintings, was commissioned to mark the opening of the Faculty of Arts, Darling Downs Institute of Advanced Education (now USQ). His compositions for organ have received high acclaim and were performed by David Rumsey internationally on several occasions, including the organ festivals of Munich and Mexico City. He wrote several film scores for the Commonwealth Film Unit and Film Australia, and was pianist for the feature film The Fourth Wish. In addition to composing, he was also active as a writer and visual artist himself. In 2001, one of his multimedia music artworks was officially recognised by the United Nations in New York, marking the International Year of Volunteers. He also held a lifelong interest in the theatre and, at one stage, even toured throughout Australia with Peter Scriven as a puppeteer with the renowned Marionette Theatre of Australia's 'Tintookies'. In the late eighties, his opera Ebenezer was presented - in puppet version - by Dale Woodward Theatres and performed for a season at the Bridge Theatre in Wollongong. The opera was also performed - in live version - at the Seymour Centre, Sydney, by the School Friends of the Australian Opera, to sell-out audiences. Terry was renowned for his stylistically diverse improvisational skills. He performed with many jazz groups and, at one stage, was resident pianist for the Adelaide New Music Players. Performances of his own works were presented by the ANMP during the Adelaide Festival of Arts. The performances included Spots and Variations 2 for Ensemble and Tape and received enthusiastic reviews. John Terry was the recipient of various grants and commissions including those from the Australia Council, and the Bicentennial Commission. His later compositions saw a turn from earlier 'experimental' forms and include two operas, orchestral and instrumental music of varying proportions, music theatre pieces for young people, songs, and works for piano. John Terry passed away on 8 May 2018. Ancient rivers (solo piano) (1999) Commissioned by John Martin.